After a stressful day getting to Costa Rica, we were ready to spend our first full day in country. We awoke at dawn for a walk on the beach and saw flocks of pelicans fishing in the ocean by dive-bombing into the water. What an amazing sight. After breakfast, we were ready for a leisurely drive from the beach to the rain forest. Getting from one region to the other meant a beautiful 3.5 hour drive on the Pan American highway from the arid coast to the rainforest region, with plenty of interesting stops along the way. We had read in our guidebooks about the fearless Tican drivers who pass each other on the narrow roads. It’s true. Native drivers don’t follow the speed limit and will pass you in a heartbeat, even on a blind corner! 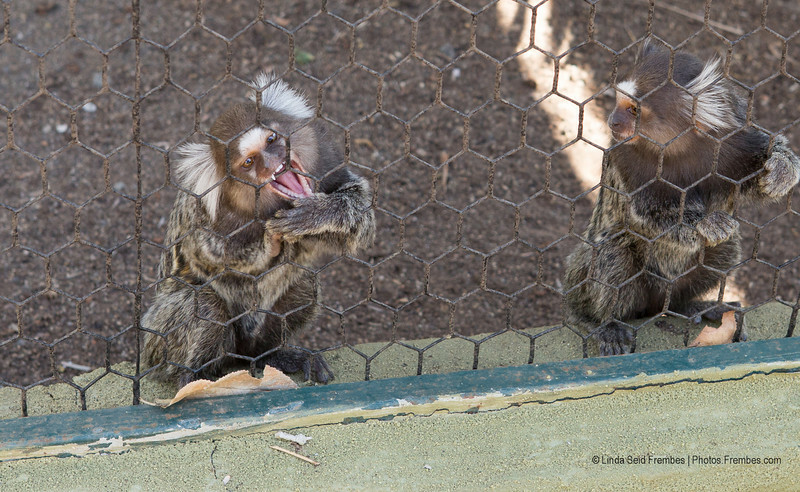 On the way to Arenal, we stopped at the Monkey Park Foundation habitat in Portegolpe, Guanacaste. This wildlife rescue center assists animals of all types, not just monkeys, with the goal to rehabilitate them for release back into the wild. 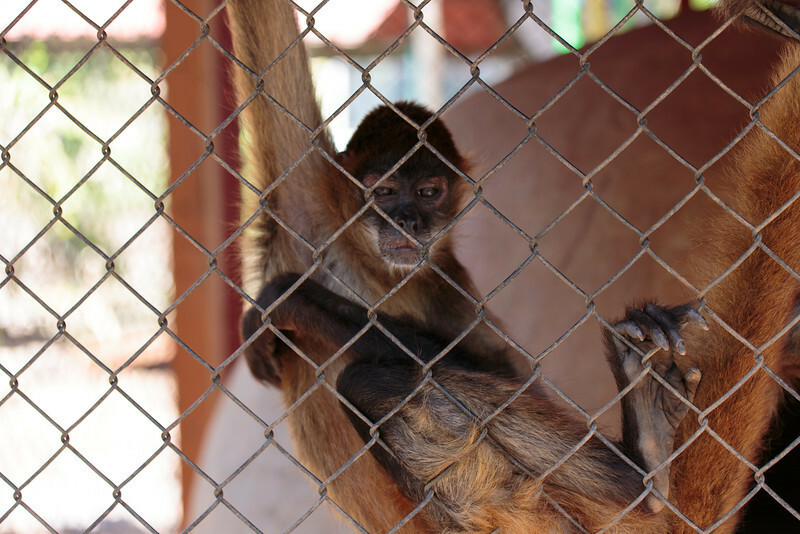 Spider monkeys, an ocelot, a toucan, a pelican, and marmosets are just a short list of what you can learn about at Monkey Park. 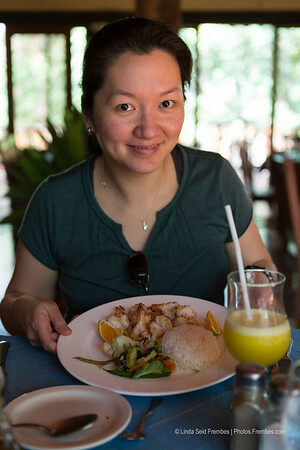 After Monkey Park, we stopped in Canas and found a fantastic restaurant at the Hacienda La Pacifica. It was possibly the best garlic shrimp I’ve ever eaten. Winding roads took us from Canas, around Lake Arenal, and through many small towns. You know when you’ve left the arid region of Guanacaste (we were there during dry season, which runs from November to April) and into the rain forest just by the sudden appearance of greenery. When we arrived at our home for the next three days at Volcano Lodge, we were incredibly amazed at our luck. We scored an end room with a fantastic view of Arenal Volcano from our back porch. 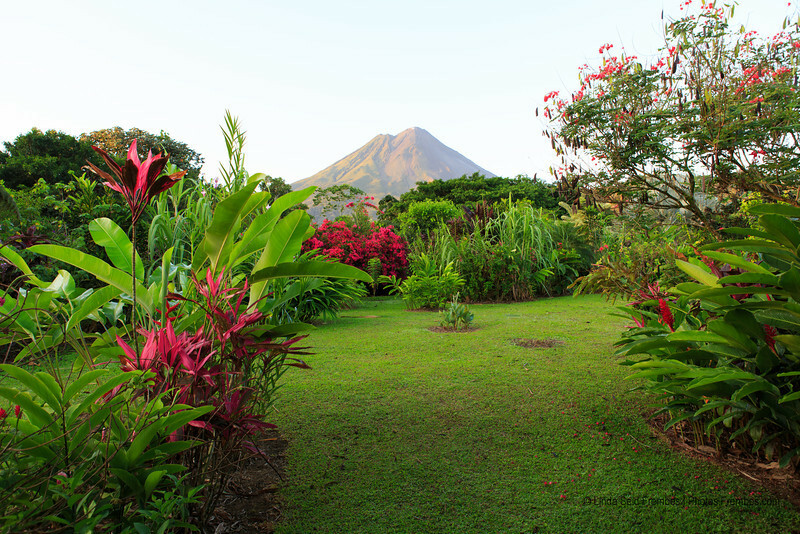 The view of Arenal Volcano from the back porch of our room at Volcano Lodge. Related: See more photos of our trip at Photos.Frembes.com/Places/Costa-Rica. Next blog post: Arenal Hanging Bridges, Arenal Volcano National Park, and the Arenal Natura Ecological Park.